Holidays to New York are exciting, vibrant and bursting with fun, culture and really good pizza. From world-famous museums to mouth-watering $1 pizza, the Big Apple will change your idea of a city break forever. 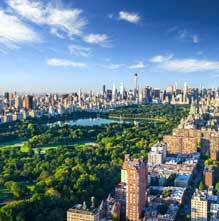 Immerse yourself in the culture, lose yourself amongst the skyscrapers, treat yourself on Fifth Avenue or escape the buzz with a bike ride around Central Park. With the whole world clamouring to create the next New York, there’s nothing quite like the real deal, which is why you should make the most of our cheap New York holidays 2019/2020. From spending summer in the city to festive Christmas breaks to New York, you’ll discover bustling nightlife, exquisite restaurants, shopping facilities on every corner, and museums and theatres galore. Shopping in New York is at its best during the start of the year when the department stores, malls and outlets open their doors to sales and offers that will make your suitcase groan but your wallet happy. There is no holiday destination quite like New York and it’s one you definitely need to tick off the bucket list, so book your New York flights today. We’ve all heard the phrase ‘a New York minute’, but you can’t get much done in one of those. However, city breaks to New York give you the opportunity to explore and experience this city as much as you want. With the seasons changing drastically throughout the year, the summer can be glorious and the winter decorated with snow. But don’t let that stop you! NYC holidays are fun and exciting whatever the New York weather throws at you. A trip to this fast paced metropolis provides you with not one city, but five. Made up of five different boroughs including Manhattan, The Bronx, Queens, Staten Island and Brooklyn, this spectacular destination has endless possibilities for the holiday of a lifetime. Although Manhattan is a favourite with tourists due to its starring role in many films and television series, the other boroughs are just as exciting and have plenty to see and do. There’s so many things to do in New York, with five boroughs coming together to provide some of the most exciting experiences a city break can provide. Catch a Broadway show, indulge in the glamour of New York’s shopping scene, or lose yourself in culture with the multiple museums of Manhattan, and not forgetting the Bronx Zoo with more than 6,000 animals. Hop on the ferry to Staten Island and take in spectacular views of the Manhattan skyline, before exploring its exciting art scene. Queens is home to a variety of sporting fun, where Citi Field, home to the New York Mets, is based. Alternatively, walk across the Brooklyn Bridge and explore the wealth of museums, the beauty of the Brooklyn Botanic Gardens and the trendy restaurant and bar scene. Head towards the conveniently titled ‘Museum Mile’ in Midtown, and enjoy the impressive offering of Manhattan’s museums and art galleries. The iconic Guggenheim museum is set in the curved Frank Lloyd Wright building, sitting prominently on Fifth Avenue. It is home to some of the most desirable and magnificent pieces of art from the last 100 years. Further along Fifth Avenue you’ll find the Metropolitan Museum of Art, which brings art from all over the world under one roof, some dating to the 5th century BC. Be prepared to spend the majority of your day here as you explore the vast and intriguing collection, shedding light on some of art’s greatest history. Alternatively, catch one of the Museum Highlights Tours at various times throughout the day. 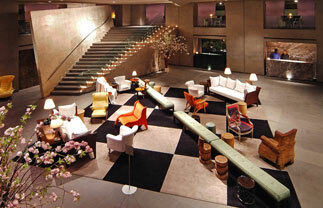 The Museum of Modern Art (MoMa) can be found between 5th and 6th Avenue. This gallery specialises in 20th and 21st century art and exhibits it in various forms, from architecture, design and drawing, to painting, sculpture, photography, film and electronic media. If you’re looking for a museum that showcases a vast and expansive history, then head to The American Museum of Natural History. This centre of antiquity contains four bustling floors and 42 permanent exhibits covering the history of the United States through the prisms of biology, ecology, zoology, geology, astronomy, and anthropology. The museum’s Rose Centre for Earth and Space also contains a planetarium and history of the Universe. When heading to New York, taking in the amazing cityscape is something you simply have to do, but make sure you also see everything else holidays to New York have on offer. The Rockefeller Center is an iconic building in itself that you have to explore. Aside from access to The Top of the Rock (the observation platform at the top of The GE Building), the building contains a 24-acre underground shopping mall, 35 restaurants, Pleasureland gardens, and a golden statue of Prometheus guarding the mid-winter ice-rink. 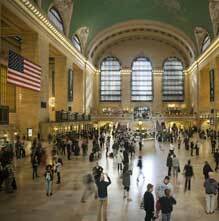 The Grand Central Railway Terminal is no ordinary train station. Walking into this station is like walking into a whole new world, as it’s filled with plenty of shopping, refuelling and photo opportunities, making it one of the most iconic stations in the world. Another landmark to check out is the New York Stock Exchange. As the world’s largest securities marketplace, it vies with London for the title of Financial Capital of the World. You can take a tour of this fascinating place charged with adrenaline, and view the proceedings from the gallery. One of New York’s most famous sights, Times Square, has been used in many Hollywood pictures and is a definite must see. At the heart of the theatre world, you can catch a show on Broadway or check out big attractions like Madame Tussaud's New York wax museum and Ripley's Believe it or Not. Either way Times Square is an excellent place to explore, even if you just marvel at the millions of lights. Venture over to Ellis Island and take a look around the amazing Museum of Immigration, or explore Liberty Island and experience all 225 tons and 152 feet of Lady Liberty herself. For the best photo opportunities of the Statue of Liberty, catch a ferry to Staten Island and look behind you for amazing cityscape photo opportunities. Make sure you spend some time in one of the most iconic areas of New York, Central Park. Amid the sunny lawns, winding paths and sports courts, many New Yorkers come to relax and spend their days. Make yourself a picnic and enjoy lunch like a local, or check out the bandstands, coffee shops and taverns scattered throughout. 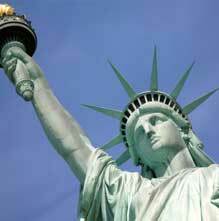 New York is recognised worldwide by images of Lady Liberty’s famous crown. A visit to Liberty Island will bring you up close and personal to the icon herself, with breath-taking views of the city skyline. If you want to journey to the top of the crown, you need to book well in advance to avoid disappointment. Venture on the 20 minute walk that takes you across this steel prodigy, affording spectacular views of this great city. It’s a rewarding way to travel to Brooklyn to explore another of New York’s fascinating districts. The 50 minute subway journey from Midtown is worth every second once you reach the nostalgic boardwalk of Coney Island. With a sandy beach, old-school amusement park and delicious hot dogs every ten steps, Coney Island opens your eyes to another part of New York’s captivating history. With New Yorkers having extremely busy lives, they love to squeeze in as much leisure time as they can, when they can, which is why New York is the city that never sleeps. With multiple bars, restaurants and delis open throughout the day and night, you can live by the New York ethos of work hard and play hard. You just need to know where to look. As New York is such a big place with so much to offer, it’s important not to overbook yourself when it comes to seeing the attractions; if you’re rushing from place to place, it doesn’t give you enough time to truly experience the city. The best thing to do is make yourself a list of ‘must see’ places (there’s some really good New York package deals to choose from), and don’t opt to see more than four in a day. That way you’ll be able to enjoy the sights and see more of the city on the way. By doing this it opens up the opportunity to wander aimlessly around New York whilst you make your way to your next ‘must see’. 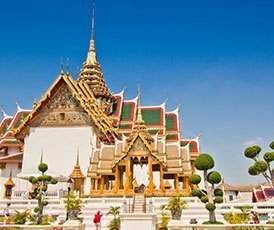 This is one of the best ways to experience this vibrant city as you check out unpredictable streets, unique market stalls, fashionable trendy boutiques and quaint cafes. For a more comprehensive look into New York culture, venture through the eclectic and colourful neighbourhoods, such as the East Village, The Meatpacking District and Greenwich Village. If you want the exciting bright lights of a Broadway show, rooftop terrace bars, cabaret and lounge bars with pianos tinkling away until the early hours of the morning, head to the city’s downtown district. 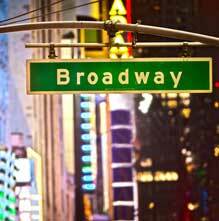 Catching a Broadway show shouldn’t be too difficult, as you can check online or in the city’s newspapers, ask the hotel concierge or ask at the venues when visiting Times Square, to find show listings. Or visit a TKTS Booth in Times Square or the Lower Manhattan Theatre Centre, which sell tickets for 20-50% off the normal price. To experience a true New York bar, head to one of the many atmospheric Jazz bars spread throughout lower Manhattan and across the borough. Jazz has become the soundtrack to New York City over the years, and places like Arthur’s Tavern, The Blue Note and 55 Bar are definitely worth a look with their excellent drinks, jazz and hospitality. What’s a holiday to the city that never sleeps without a trip to a nightclub? With many New York nightclubs coming in and out of fashion at the blink of an eye, it’s worth checking online for the current hotspots, or the free L Magazine, which highlights the latest place to be. Alternatively try the Meatpacking District, a buzzing area of converted warehouses. Try Automatic Slims and Catch 22 with their trendy clientele, ultra-modern interiors and hip cocktails. For a glittering night out on the tiles, the Bowery Ballroom is a must. With gleaming Art Deco tiles, an elegant cocktail lounge, and 500-capacity concert hall; it’s now home to eclectic and electrifying alternative and electro club nights. New York has a lively and vibrant gay scene, centred on Brooklyn’s Park Slope neighbourhood, but there are plenty of bars and clubs in Manhattan too. To get an at-a-glance guide to what’s hot, and what’s not, the free gay guide HX should be your first port of call. Or call in at the Lesbian and Gay Community Center, between 7th and 8th avenues to find out more information. Comedy is well represented in New York City; there’s plenty of stand-up ‘improv’ and cabaret to keep you laughing all night long. New York’s cosmopolitan communities combine to create more culinary styles per square mile than almost anywhere on earth. From burgers to borscht, delis to fine dining, there’s something to suit every palate in this city that loves to eat. Midtown Manhattan’s hotel restaurants, big name chains and tourist-friendly buffets run the gastronomic show, ensuring holidays in New York are filled with great flavours from start to finish. In general, steer away from the ‘all you can eat’ world buffets, and blaring neon-signs of Times Square, Broadway and the main tourist spots and, instead, head to the streets lining the neighbourhoods of Chinatown, Upper Manhattan, the East Village, the Upper West Side, and Brooklyn for meals to remember – and at an affordable price, too. New York’s not short of great, family-run Italian restaurants. Try the restaurants around the Lower East Side, and especially around Little Italy. Italian restaurants in Manhattan are fast, friendly and surprisingly good value; and the ice-cream is heavenly! Chinatown is the place to head for spicy, flavoursome and authentic Chinese, Asian and ‘fusion’ eastern cooking. And, increasingly, flavours from Vietnam, Laos and Cambodia are adding even more exotic combinations of tastes. In general, restaurants around Henry and Madison Street are dependable, serving set-price dinners for around $20-$30 – perfect if you’re on a cheap break to New York! The Village, SoHo and Tribeca are some of the best places to eat in NYC right now, creating exciting and unique new flavours and styles of cooking, and it’s where the city’s rising culinary stars offer nightly displays of inventiveness. For more earthy, and filling fare, the Meatpacking District, the Lower East Side and Gramercy are the places to eat out without fuss, in a range of great value, honest and sociable diners, restaurants and family-friendly grills. The West Side’s the place to head for TexMex, Cajun and a range of restaurants championing ‘new American cooking’, blending centuries old ‘peasant food’ with a modern twist! Elsewhere, the legendary Katz’s Deli (East Houston St) is home to that all-American institution – hot dogs. And their salami specials are meaty and delicious too. And, film fans, this is the place where they filmed ‘that’ scene in When Harry Met Sally. For fabulous burgers, you have to head to the somewhat secretive, and worth seeking out Burger Joint, at the Le Parker Meridien. There are simply two items on the menu – burger, or cheeseburger (oh, and fries, of course!). When you’re this good at burgers, why complicate things? Finally, for a view as impressive as the culinary fare, head over the East River to The River Cafe nestling at the foot of the Brooklyn Bridge. Book a table for twilight and enjoy spectacular views across the water to Manhattan, as the lights are turned on. The New York shopping scene is one of the best in the world. From the dazzling department stores of 5th Avenue to the sleek boutiques on the Lower East Side, there are more opportunities to find the perfect gift in Manhattan than any city. Barneys is the place to head for edgy fashions and one-of-a-kind home wares, while Bergdorf Goodman is a more traditional store, with excellent shoes, accessories and leather goods. FAO Schwartz offers excellent crafts, gifts, jewellery, and games. Saks Fifth Avenue store offers a glittering collection of labels, luxury goods and cosmetics. For high end fashion, Madison Avenue is the place to head for, featuring flagship stores from some of the world’s top designers – from home grown greats such as Calvin Klein and Ralph Lauren to Italian megastars of the fashion world, Prada, Versace and Fendi. And, for tourists looking for something shiny and new, Tiffany’s and Van Cleef and Arpels are on opposite sides of 5th Avenue offering a sparkling selection of gems. Greenwich Village offers a dizzying array of up-to-the-minute fashions, funky gifts and collectables from comics to CDs. Bleecker Street and 8th Street’s cool fashions and footwear, and Carmine Street and 7th Avenue’s delis and galleries are all worth an afternoon’s wander, as are the boutiques and perfumeries of Christopher Street. Another upcoming area is the Chelsea. With over 150 galleries, Chelsea’s ‘Art Quarter’ tag is deserved – and the area between 20th and 26th streets, is lined with art stores, antiques and retro home wares stores. The Meatpacking District has bloomed recently, with Stella McCartney, Christian Louboutin and Alexander McQueen setting up shop. But look out for Jeffrey New York, an offshoot of a cool Atlanta department store, with its fabulous shoes, menswear and leather goods. Herald Square, where 34th Street, Sixth Avenue, and Broadway meet, is home to the American institution that is Macy's. The biggest department store in the world has an unbeatable selection of fashions, cosmetics, gifts, shoes, and home wares. Soho is still a fashionable place to shop, with cobbled streets and cast-iron arcades, while you’ll find most of the recognisable brands on Soho’s Broadway. Check out the perfumes and cosmetics giant, Sephora, and A/X Armani Exchange, and hunt for bargains at the H&M hyperstore. Bloomingdale's chain – a trendy US department store, on a par with John Lewis - has a downtown branch on Broadway, and the Apple Store, Soho is geek central! Shopping breaks to New York really do offer everything you could ever imagine. Spring or autumn is a great time to visit to miss the extremes that New York weather seems to go through. Summer time is boiling hot with temperatures reaching 29°C, while New York winters bring snow, blizzards and freezing temperatures. 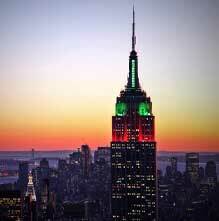 But if you’re brave enough to face the cold, New York Christmas breaks are so worth it! Do you need a visa for New York? Everyone travelling into America must have completed the Electronic System for Travel Authorisation, or ESTA for short, a US Customs & Passport Control entry requirement. US Immigration may well refuse you entry at border control if you do not complete the online form. Please check with your tour operator while booking your holiday. New York is probably the best place to celebrate Chinese New Year outside China. With several days of celebrations, there are a number of free events held within the city, including The Firecracker Ceremony, Cultural Festival, and the Lunar New Year Flower Market, followed by the Lunar New Year Parade and Festival in February. Head to Madison Square Garden and catch the pandemonium and excitement that is the Westminster Kennel Club Show. With more than 200 pooches taking part in this champion dog show, watch in amazement as the regal canines battle it out to be named top dog. Ireland is a great place to celebrate St. Patricks Day, but if you happen to be in New York you can have just as much fun. The annual St. Patrick’s Day Parade is the city’s oldest and largest, so celebrate Irish culture and the Catholic Faith on the streets of New York. This annual festival was created by Robert De Niro in the wake of September 11. Now on par with the likes of Sundance and Cannes, the festival celebrates film, music and culture, transforming the neighbourhood into a hub of red carpet glamour. With more than 100 world films shown, there’s even free drive-in screenings – no car required. 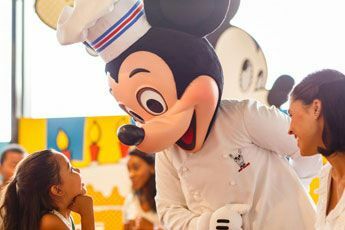 This annual food festival sees more than 200 vendors and restaurants come together to serve up various culinary delights, satisfying everyone’s taste buds. Taking place over 15 blocks, you can enjoy gastronomic feasts from the world over, with Greek, Brazilian, Moroccan, Ukrainian and Italian specialities all on offer. There’s also plenty of music, arts, crafts and dancing to go along with the edible feast too. With a vibrant and thriving LGBT community, the city embraces its incredible diversity with annual pride week. Fun for people of all ages and backgrounds, there are various activities happening throughout neighbourhoods in the five boroughs of New York. Pride Week concludes with the famous march down Fifth Avenue. Take a moment to celebrate one of the most historically significant days in America’s long history; Independence Day. With thousands of fireworks lighting up the New York skyline during the spectacular display, there’ll also be musical accompaniment from the New York Pops Orchestra and special guest stars. With millions watching in person and at home, waterfront locations are the best spots to obtain spectacular views. Lasting for two weeks during August, the Fringe Festival plays host to over 1,000 distinct and unique performances. With local and world theatre companies taking part, alongside hip-hop musicals and comedians who range from absurd to social commentary, there’ll be something to suit everyone. You can even buy a multi-day pass to make the most of everything on offer at the Fringe. Head over to Brooklyn and experience one of the city’s biggest and best street fairs. Attended by an estimated one million people, the festival features a host of different handicrafts and culinary delights, with a mixture of jazz, rock and R&B music coming from the multiple stages. Alongside this you’ll find storytelling and pony rides for the children. A fun filled festival for the whole family to enjoy. You haven’t experienced Halloween until you’ve experienced it in the USA. When in New York on Halloween head to the West Village and take part in the massive party, which features fantastically costumed characters, puppets, dancing and bands amongst the estimated two million spectators. This lively New York tradition is a Halloween experience like no other. Experience one of the biggest days in the New York calendar, the Thanksgiving Day parade. Filled with school marching bands, celebrity guests and performances making the streets come alive like never before, you’ll be awestruck when the true stars of the show, the balloons, make their way past. With millions of people cheering along the 2.5mile route, you’ll see inflated versions of Spongebob and Snoopy amongst others on this magical day. If you’re in New York to welcome in the New Year, then the only place to be is Times Square. With more than a million people baring the cold and gathering in one of New York’s most famous locations, you can be part of the world’s most iconic New Year party as you embrace the musical performances, balloons, confetti and fireworks whilst waiting for the ball to drop. How long are flights to New York? What is the currency in New York? What is the main airport in New York? If you’re not swayed by our New York holiday deals, there’s plenty other fantastic destinations to see in the USA including, laid-back California holidays, quirky San Francisco holidays or culture-packed Washington DC holidays. 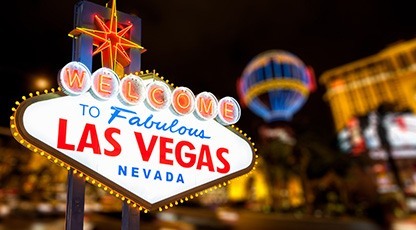 And not forgetting holidays in Vegas, where the party never stops! Looking for an alternative to our New York holidays? 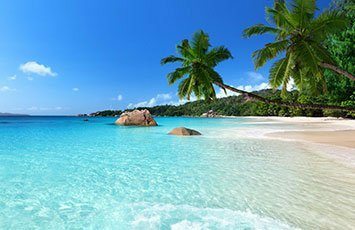 Why not head to Canada to see the fascinating nature, book an Indian Ocean holiday to enjoy relaxing in paradise, or visit Australia for an action-packed adventure. The above prices are guidelines only and are correct at the time of publishing. Subject to availability. Other travel dates and departure airports are available, supplements may apply. Please use the search box or call for details. For more information please read our pricing terms and conditions.